Growth Habit: An erect plant which can reach a height of 2.75m but normally averages 1-1.5m. 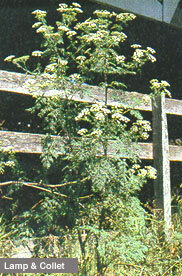 Hemlock has hollow, pale green stems with purplish patches. The plant also has large, pale green leaves, similar to carrot leaves. Type of Plant: Hemlock can be an annual or biennial. Flowers: Broad flower heads are produced in summer, which comprise hundreds of tiny white flowers. Fruit/Seed: Thousands of tiny seeds are produced in autumn. Dispersal: Reproduces by seed, and from fragments of the root system if disturbed, such as by earthmoving equipment. Distribution: Hemlock can be usually found on disturbed ground or in damp areas. It is also common on roadsides. All parts of the plant are poisonous to both humans and livestock. This is due to the presence of 5 alkaloids, coniceine and coniine being the most active. The plant is toxic either green or dried in hay. Rarely causes significant economic losses to crops. Grubbing (all year). Isolated plants may be manually removed with a fork or similar tool. Wear gloves as this plant has poisonous properties. Herbicide (spring, summer). Herbicides registered in Tasmania include 2,4-D, triclopyr, MCPA + glyphosate. BE WARNED: As herbicide treated plants are attractive to stock, they must be kept away till plant completely disintegrates.